A Monster Year for BK Story Voyager’s Touch a Truck! 2017 Benefit Will Salute Heroes of Affordable Housing, Education, and Saving Community Center! Happy to Be Back to School! When real estate entrepreneur Maria Rosado decided to retire she was determined to see the tenants in her buildings remain, and not face any fear of rising rents or displacement pressure. She wanted to make sure her portfolio wound up in good hands. Then along came JOE NYC and St. Nicks Alliance in February 2017. JOE is a joint ownership entity that acquires and asset manages affordable multifamily properties on behalf of member non-profit Community Development Corporations (“CDCs”) and St. Nicks Alliance is one of JOE’s founding member organizations. In selling her 43 building portfolio to the joint venture between St Nicks Alliance and JOE, Ms. Rosado achieved her goal to sell to a new owner who was fully committed to long term affordability. A rare example of a real estate portfolio in New York City owned by a for profit developer being acquired by a nonprofit organization. 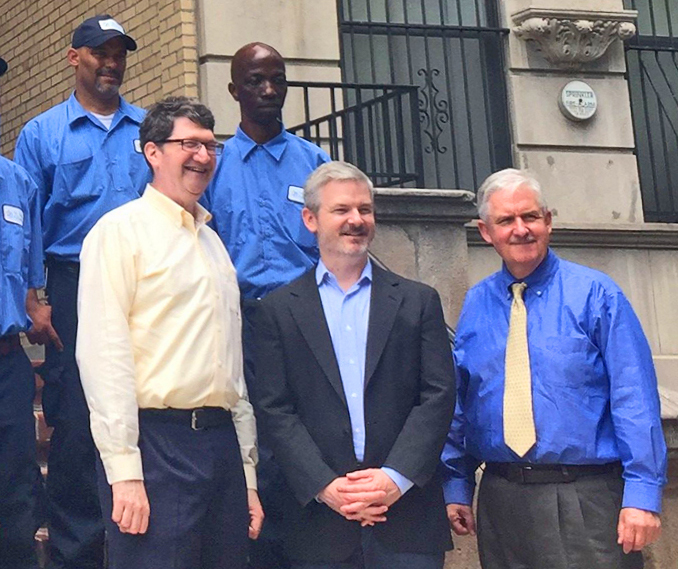 The $7.5 million acquisition was financed through a $5.3 million loan from LISC NYC, and a $965,382 equity investment from St. Nick's Alliance as well as a $1.2 million equity investment from JOE NYC, which was sourced by LISC’s New York Housing Stabilization Fund. Rosado’s Jefferson and Watson clusters represent 248 units of affordable housing, which will be maintained as affordable housing over the long term. The transaction represents a rare example of a real estate portfolio in New York City owned by a for profit developer being acquired by a nonprofit organization. There were a number of technical complexities in this transaction for which LISC NYC was uniquely suited. In addition to providing the acquisition loan, LISC NYC Director of Housing Arturo Suarez worked tirelessly with St Nicks, JOE NYC, and their development consultant Forsyth Street Advisors to consider financing options and how to structure the transfer. In addition to receiving approval from HPD, the transaction required the approval of the New York Equity Fund. This process was shepherded through the process by Lisa Deller, Vice President of Asset Management for National Equity Fund (NEF), an affiliate of LISC. In addition, St. Nicks Alliance is proud to announce that Maria Rosado will be one of the honorees at their annual awards benefit and 42nd anniversary celebration on November 9, 2017 at the Greenpoint Loft (67 West Street, Brooklyn, NY 11211). Laura James was recently elected as St. Nicks Alliance Vice Chairperson after serving on the Board of Directors for 6 years. Her role as an executive at the United Parcel Service possesses her with business expertise; this in addition to her desire to keep North Brooklyn affordable to families rouses her responsibility as Vice Chairperson. She has served on St. Nicks Alliance’s Board Fundraising Committee as well as on its finance and youth committees. “Laura brings her passion for community and contributes her boundless energy to make communities better places for all,” commented Joseph Robles, SNA Board Chairman, upon Ms. James election. During her time in the youth committee, Laura sparked the Touch-A-Truck concept as a way to support the organization’s push to ensure that children read and succeed in school. The Touch-A-Truck event (our 5th of which took place on Saturday, September 30th) raises funds to support the BK Story Voyager, flagship of St. Nicks Alliance’s literacy campaign. This initiative is producing higher academic and reading scores and school success. Not only does Laura generate ideas, she commits herself to the project’s progress. Ms. James has also desired to create employment opportunity link-ups between UPS and St. Nicks Workforce Development Center. Building these kinds of bridges strengthens neighborhood infrastructure, which enables communities to prosper. Laura resides in Greenpoint with her husband, Paul, and daughter, Samantha. The 5th Annual BK Story Voyager’s Touch a Truck was a record breaker! The sun was shining, it was short-sleeve weather, and more families came out to get their hands on some big trucks. We sold more than triple the tickets of last year! Trucks from: UPS, Waste Management, Knights Auto Care Center, National Grid, FDNY Engine 229/Ladder 146, conEdison, and Metropolitan Garden Design peppered Leonard Street in front of MS 126. Also on hand were a bouncy castle, many art projects, face painting, and regular family Zumba sessions led by Danielle from Hosh Yoga. The event was supported with funding from Bank of America, UPS, Waste Management, ExxonMobile, McDonalds, Panera Bread, Borah Goldstein, Kohls, and Broadway Stages. 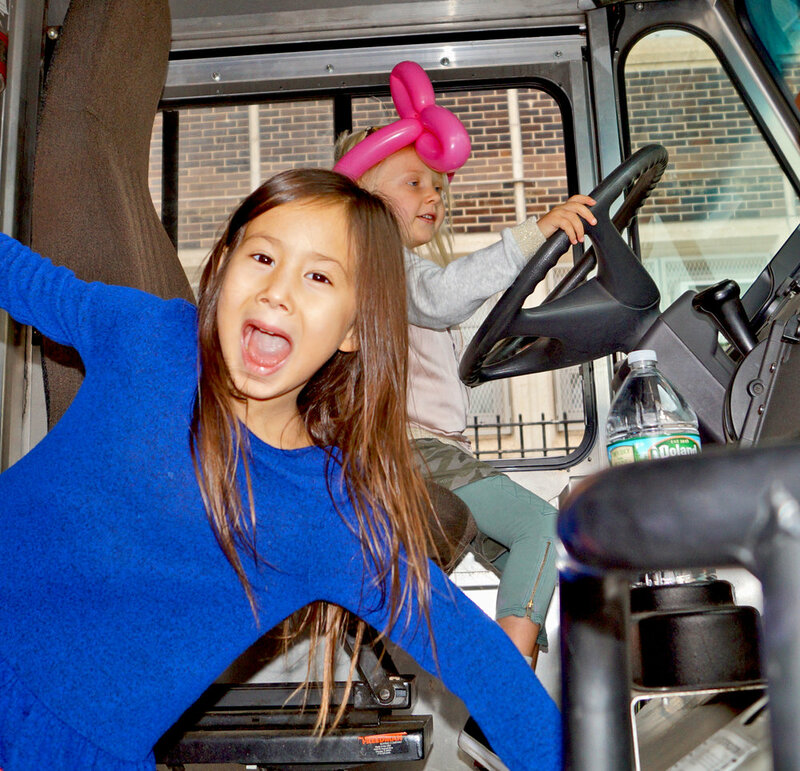 Proceeds from ticket sales help finance the BK Story Voyager’s operating costs so it can continue its journey to inspire North Brooklyn’s children love of books and to improve literacy. 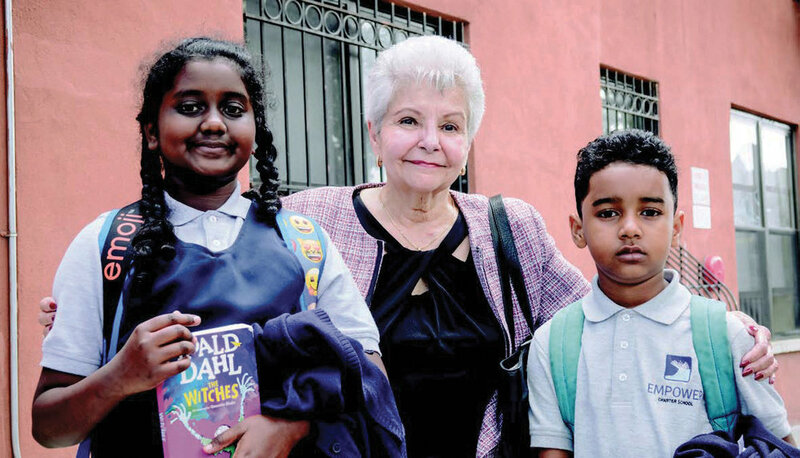 Maria Rosado (with two neighborhood school children) efforts in affordable housing will be recognized at this year’s celebration. She is in front of one of her buildings at 2187 Strauss Street in Brownsville. St. Nicks Alliance isn’t just getting older, it is getting better. The more than four decades it has spent revitalizing and strengthening North Brooklyn neighborhoods has brought them invaluable experience and knowledge to accomplish goals. In addition to sharing this year’s triumphs at the event, St. Nicks Alliance will celebrate the achievements of individuals who have shown long-standing devotion to making North Brooklyn a better place to live, work, and raise a family. This year’s honorees will include the most accomplished individuals in: affordable housing (Maria Rosado) andeducation (Superintendent Alicja Winnicki and Brooklyn District 14 principals Alison Alexander, Eva Irizarry, Roseann Lacioppa, and Sandra Noyola). They will also honor the legal team of Marc Aronson, Gregory Messer, Martin Needelman and Brooklyn Legal Services who supported the leadership of our elected officials that helped save the Swing Sixties Senior Center and Small World Child Care! Their 2017 Annual Awards Benefit and 42nd Anniversary celebration will take place on November 9 from 6:00–9:00 PM at The Greenpoint Loft (67 West Street). Johnny (identity masked), a third-grader at PS 18 with Autism Spectrum Disorder and Anxiety Disorder, was struggling academically and behaviorally. St. Nicks Alliance’s NABE 3.0 transformational coaching was there to step in to provide Johnny, as well as other struggling students and their families, the support they need to succeed. An approach was designed by the coach, counselors, and therapists that would give Johnny the tools to defeat his obstacles. Difficulty engaging with his classmates and emotional outbursts caused Johnny to shut down and isolate from others. He also displayed aggressive behavior towards himself. He participated in play therapy during which a level of trust was formed that he revealed his interest in superheroes to his transformational coach. The transformational coach then guided him to discover his inner superhero strengths. In doing so he gained confidence. In the course of the school year, he became better able to manage his emotions, formed the ability to create and maintain friendships, and made significant academic progress. Johnny is now on path to succeed. Johnny’s Coach also engaged his mom and discovered her wish to earn a High School Equivalency Diploma. She is now working with St. Nicks Alliance’s Workforce Center to achieve this goal. The NABE 3.0 uses transformational approaches to help children, adults, individuals, and families identify and overcome obstacles to success. Launched three years ago, the initiative’s strategies continue to address poverty, employment, and academic success in a very low-income target area of Williamsburg’s 11206 zip code. Partnerships with public housing, legal, financial, and government entities, in addition to schools and others organizations are core to NABE 3.0’s model. 5th grade afterschool class at PS 34 is happy to be back together! The first day of school brought a palpable wave of joy from kids at St. Nicks Alliance’s sixteen afterschool sites. School Settlement Association welcomed kids that will begin their 4–5 years of afterschool at The Sett. They also welcomed back their “veteran” students for their final year. Afterschool at PS 34 got back in the swing of learning with STEM and art projects.